We offer modern solutions and technologies which allow you to improve your business operations and emhance the image and implementation of your projects. 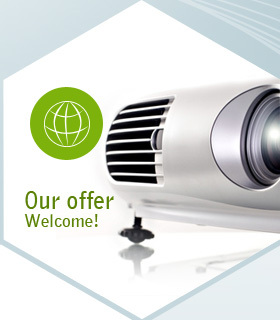 We offer cooperation in implementing multimedia equipment as well as modern and efficient forms of presentation. We deal with complex services beginning with an analysis of customer needs, consultations and design, through the implementation of solutions and systems, to the final stage of delivery and the configuration of equipment and project implementation. We require no IT knowledge from our customers. We do, however, ensure comfort, availability and a quality of service that you have never come across before. Professionalism and high quality of services.